After World War II, Carl Borgward started Lloyd as a lower-priced alternative to the higher-end Borgward family of cars. Lloyd’s first car, the LP 300, was introduced in 1950. Due to the lack of steel available after the war, the LP 300 infamously had a wood and fabric body, leading to the well-known phrase “He who is not afraid of death drives a Lloyd”. Despite this, it had strong initial sales when introduced to the US market, undercutting the similar sized VW Beetle by $300. After World War II, Carl Borgward started Lloyd as a lower-priced alternative to the higher-end Borgward family of cars. Lloyd’s first car, the LP 300, was introduced in 1950. Due to the lack of steel available after the war, the LP 300 infamously had a wood and fabric body, leading to the well-known phrase “He who is not afraid of death drives a Lloyd”. Despite this, it had strong initial sales when introduced to the US market, undercutting the similar sized VW Beetle by $300. 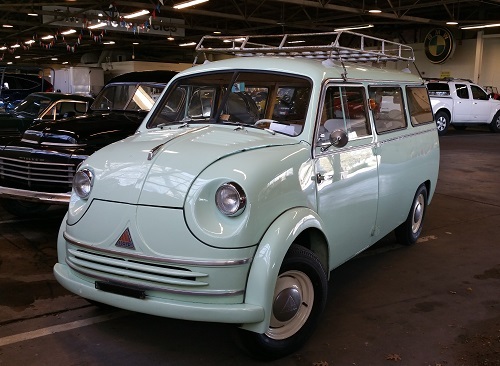 By 1954, full steel-bodied cars were introduced, as was the multi-purpose van, the LT500. This 1959 model is a later LT600, utilizing a 596cc two-cylinder, four-stroke engine, producing about 20hp and a top speed of 53 mph. The LT500/600 is considered by many to be one of the earliest iterations of a multi-purpose vehicle or mini-van.